We look forward to meeting the training needs of your department. 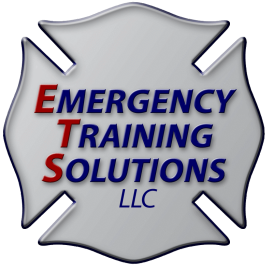 Emergency Training Solutions, LLC (ETS) provides high-quality training curriculums for the emergency services industry in a variety of subjects including firefighting, rescue and hazardous materials operations. In addition to writing and distributing PowerPoint-based training programs, ETS offers onsite training services to emergency service organizations. Our team consists only of experienced firefighters and fire service instructors. We strive to provide well organized training sessions to make the most of our limited time with our personnel. We do not believe in a “one size fits all approach” and will adapt the training program to the specific needs of your organization to increate the overall effectiveness. Our realistic scenario based training evolutions are designed to challenge and motivate all students, from the six-month probie to the 20-year veteran. Each scenario is followed by a critique conducted by the students and instructors. ETS instructors have lectured on Hybrid Vehicles at FDIC, the New York Emergency Preparedness conference and the New York State Vital Signs EMS Conference. The founder of ETS, Jason D. Emery has published articles on Hybrid Vehicles in Fire Chief Magazine and Fire Engineering’s e-newsletter. Pennwell Corporation recently selected ETS to develop PowerPoint training materials for the upcoming Fire Engineering Handbook for Firefighter I and II. We believe that the presentation of the lesson plan is as important as the content. Our programs are designed to take that information and present it to the students in an informative and yet interesting format. Our programs make full use of the capabilities of PowerPoint to maintain a dynamic approach to classroom learning. All of our program developers are active duty firefighters and fire instructors, allowing us to focus the curriculum in a manner that is pertinent to concerns of today’s emergency responders.